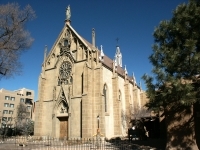 Although the Loretto Chapel on the Old Santa Fe Trail is no longer used for worship, it nevertheless remains a place of congregation, mainly for tourists who come to marvel at the chapel's 'miraculous' spiral staircase. The chapel, copied from Sainte-Chapelle Church in Paris, was built in 1873 to serve as chapel for the Sisters of Loretto's school for young women. When the building was close to completion workers discovered the design had not left sufficient room for the proposed staircase to the choir loft. The only answer appeared to be a cumbersome ladder, which was not an attractive proposition for the Loretto sisters who decided to pray about the problem to St Joseph. Their prayers were answered in the form of a carpenter riding a donkey, who arrived and offered to build a spiral staircase. He accomplished this with only a saw, hammer and T-square, manufacturing a miraculous staircase, which is held aloft by no visible means of support. Opening times: Monday to Saturday 9am-5pm, Sunday 10.30am-5pm.